File trolley for storing up to 100 A4 size suspension files or 10 standard suspended lever arch files (80 mm) or 18 small suspended lever arch files (40 mm). 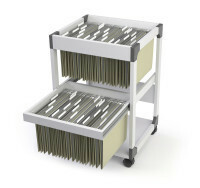 File trolley on two levels for storing approximately 200 A4 suspension files, up to 10 standard suspended lever arch files (80 mm) or 18 small suspended lever arch files (40 mm). Suitable for all sizes such as A4, Folio or Foolscap. 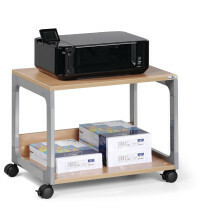 Four level multi function/printer trolley. 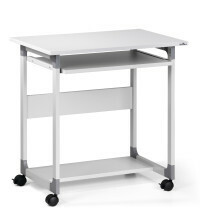 Designed with strong metal powder coated frame with glass enforced plastic corners. The top and bottom shelves are made from 19 mm thick, melamine covered hardboard. Three level overhead projector trolley. The lid is adjustable to help accurately angel the projection. 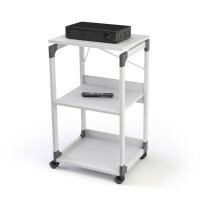 High quality multi-function trolley with two shelves, ideal for printers and accessories. Measurements: 600 x 477 x 432 cm (W x H x D). File trolley on two levels for storing approximately 80 A4 suspension files, up to 8 standard suspended lever arch files (80 mm) or 16 small suspended lever arch files (40 mm). Suitable for all sizes such as A4, Folio or Foolscap.